All too often consumers have to deal with impersonal customer service. Such was not the case with this purchase. My order was processed and shipped quickly and was reasonably priced, all of which is great, but you know what really impressed me? Upon opening my package of strings, I was greeted by a note recognizing me as a new customer and thanking me for my business along with a "Strings By Mail" sticker. Maybe I'm easily impressed, but in these times when kindness and a good word seem to be the exception rather than the rule, I definitely take note when they come my way. The effort to recognize and thank me as a new customer has sealed the deal for me. I'm looking forward to my next purchase! 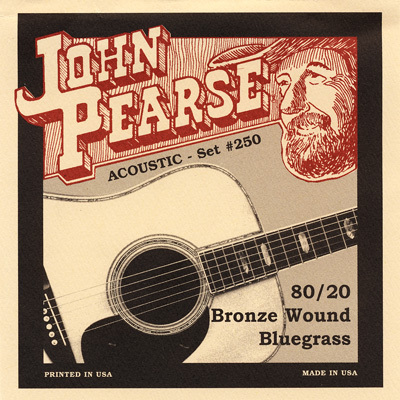 John Pearse Bluegrass strings work very well for me on my Martin OM21. The hybrid set increases the bass response to make a small bodied guitar really ring. I use JP strings on other acoustic guitars, as well, and they sound good and last a long time. I've bought a lot of strings from Strings By Mail over the past few years, and am 100% satisfied with this company. I have four guitars to keep strung, and for me, this is the best way to do it. Prices, especially sale prices, are very good, and shipping is reasonable and quick. I recommend Joh Pearse strings, and Strings by Mail, often.